This species is sometimes confused with B. brigittae (see 'notes'). Well-conditioned specimen from the aquarium trade. 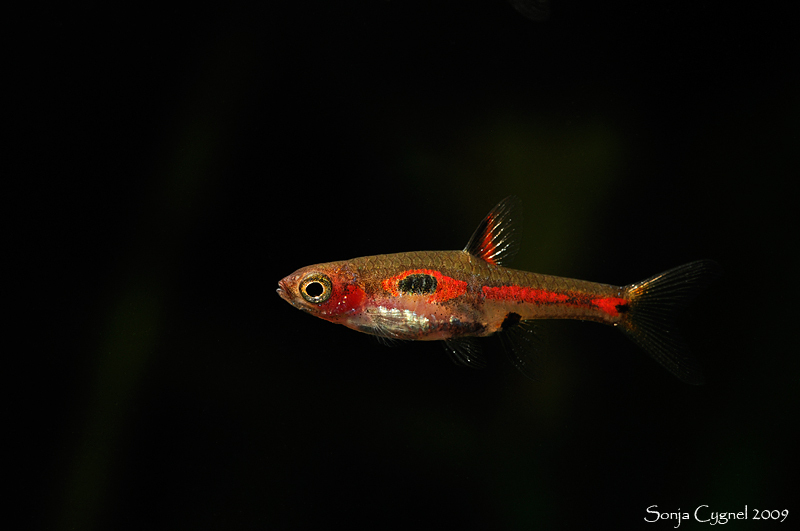 Boraras: anagram of the generic name Rasbora, in reference to the reversed ratio of abdominal and caudal vertebrae in this genus. merah: from the Indonesian word merah, meaning ‘red’, in allusion to the base body colour. Appears endemic to southern Borneo. The type specimens were collected from the Jelai Bila river basin at Nataik Sedawak, presumably a settlement of some kind, near the town of Sukamara in the Indonesian province of Kalimantan Tengah (Central Kalimantan). The full type locality is ‘Sungei Jelai Bila basin, 2°41’S, 111°13’E, Nataik Sedawak, about 30 kilometers south of Sukamara, Kalimantan Tengah, Borneo’. Its range extends westwards from the Jelai Bila watershed whereas that of the congener B. brigittae, with which it may occur sympatrically there (see ‘Notes’), extends east. Inhabits black water streams and rivers associated with ancient forest peat swamps. The water is stained brown due to the release of tannins and other chemicals released by decomposing organic matter and the substrate scattered with fallen leaves, twigs and branches. Such environments characteristically contain very soft (negligible hardness), acidic (pH as low as 4.0) water and are often dimly-lit due to the forest canopy above. These biotopes are under serious threat across much of Southeast Asia from rubber/palm oil plantations, building developments and other human activities. Though small it still needs space to swim and dominant males will form temporary territories when spawning so a group is best kept in a tank with base dimensions of at least 45 ∗ 30 cm. Best maintained in a densely-planted aquarium and is an excellent choice for the carefully-aquascaped set-up. The addition of some floating plants and roots or branches to diffuse the light entering the tank also seems to be appreciated and adds a more natural feel. Filtration does not need to be particularly strong as it mostly hails from sluggish waters and may struggle if there is a fast current. To see it at its best a biotope-style set-up can also make an interesting project. A soft, sandy substrate is probably the best choice to which can be added roots and branches, placed in such a way that plenty of shady spots are formed. If you can’t find driftwood of the desired shape common beech or oak is safe to use if thoroughly dried and stripped of bark. The addition of dried leaf litter further emphasises the natural feel and encourage growth of microbe colonies as decomposition occurs. These tiny creatures can provide a valuable secondary food source for fry whilst the tannins and other chemicals released by the decaying leaves are thought to be beneficial for blackwater fish species. Leaves can be left in the tank to break down fully or removed and replaced every few weeks. Fairly dim lighting should be used to simulate the conditions the fish would encounter in nature. You could add aquatic plants that can survive under such conditions such as Microsorum pteropus, Taxiphyllum barbieri or Cryptocoryne spp. Do not introduce any Boraras sp. to a biologically-immature aquarium as they can be susceptible to swings in water chemistry. As with other Boraras species it’s likely to be a micropredator feeding on small insects, worms, crustaceans and other zooplankton in nature. In the aquarium it will accept dried foods of a suitable size but should not be fed these exclusively. Daily meals of small live and frozen fare such as Daphnia, Artemia along with good quality flakes and granules will result in the best colouration and encourage the fish to come into breeding condition. 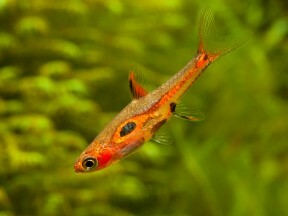 This species is very peaceful but does not make an ideal community fish due to its small size and rather timid nature. It will do best when maintained alone or with other diminutive species such as Microdevario, Sundadanio, Danionella, Eirmotus, Trigonostigma, pygmy Corydoras and small Loricariids such as Otocinclus. It also makes an ideal companion for shy anabantoids such as Sphaerichthys, Parosphromenus or the more diminutive Betta species, and in a planted set-up can be housed alongside freshwater shrimp of the genera Caridina and Neocaridina. It’s a schooling species by nature and really should be kept in a group of at least 8-10 specimens. Maintaining it in decent numbers will not only make the fish less nervous but will result in a more effective, natural-looking display. Males will also display their best colours and some interesting behaviour as they compete with one other for female attention. Mature females are noticeably rounder-bellied and often a little larger than males. Males are generally more attractive with dominant individuals often displaying intense colouration. Like many small cyprinids this species is an egg-scattering, continuous spawner that exhibits zero parental care. That is to say when in good condition and in the presence of both males and females relatively small numbers of eggs will be laid daily. In a well-furnished, mature aquarium it is therefore possible that small numbers of fry may start to appear without human intervention. However if you want to increase the yield of fry a slightly more controlled approach is required. The adult group can still be conditioned together but one or more small, perhaps 10-15 litre, containers should also be set up. These should be very dimly lit with the base either left bare or covered with some kind of mesh of a large enough grade so that any eggs that fail to adhere to the plant can pass through but small enough so that the adults cannot reach them. The widely available plastic ‘grass’-type matting can also be used and works very well. The water itself should be of pH 5.0-6.5, 1-5°H with a temperature towards the upper end of the range suggested above. A decent-sized clump of Java moss or other fine-leaved plant should also be added filling perhaps half the available space. Filtration is not really necessary but you can use a small, air-powered sponge filter if you prefer. Two or three pairs of well-conditioned adult fish should then be introduced to each container. It is wise to make the transfer slowly in order to avoid excessive levels of stress but if conditions are to their liking they should begin to spawn the following morning. While this species certainly will eat its eggs it appears not to actively hunt for them as is the case with many small cyprinids. Once spawning has commenced it should continue on a daily basis. The pair(s) should be left in situ for no more than a couple of days before being removed as the first eggs should hatch by the second day after the initial spawning. The tiny young will survive on their yolk sacs for another 24 hours or so after which they will require Paramecium or other microscopic food. After a week to ten days they should be large enough to accept Artemia nauplii/microworm etc. As the days pass additional fry should start to appear from later spawning events. It’s best to wait a week or two before starting to perform small water changes in order to avoid unduly shocking the young fish. B. merah possesses a colour pattern which is comparable to its congeners B. brigittae and B. maculatus but can be easily identified as it lacks colour in much of the body with the red pigmentation tending to be concentrated around the dark body markings. 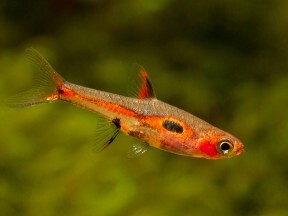 It’s sometimes seen on sale with the alternative trade name of ‘phoenix rasbora’. B. brigittae is most similar but possesses a greater proportion of orange/red pigmentation, and the dark body markings usually form an unbroken stripe whereas they tend to form a series of spots or blotches in B. merah. Fully-striped male individuals do exist, however, and this has led to speculation that B. brigittae and B. merah are the same species (Körner, 2010). The same author also reported that in an ‘eastern’ population (from the area around Banjarmasin?) both sexes develop a striped pattern before maturity, while in the ‘central’ population (Palangkaraya, where fish are collected for the aquarium trade) only males develop the striped colour pattern, and only when sexually mature. Kottelat (2013) argued that the different ontogenies in colour pattern, and presumed geographical distribution of these two populations, supports the existence of two species, whilst also noting that Palankaraya is not close to the type locality of B. merah; the Sungei Jelai Bila river basin in Kalimantan Tengah, much further west. Boraras was erected in 1993 in order to separate a small group of species from the larger Rasbora assemblage on the basis of differences in morphology and reproductive strategy. 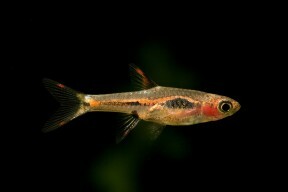 In older literature they are therefore referred to as members of Rasbora and following Liao et al. (2010) the genus is a member of the rasborin sub-group within the subfamily Danioninae (the other sub-group contains the danionins). This group is further subdivided into six clades (clusters of closely-related species) of which Boraras (or at least B. brigittae; the only species involved in the study) is included in ‘clade three’ alongside Horadandia atukorali, Rasboroides vaterifloris, Trigonostigma heteromorpha and three species previously included in Rasbora but moved into new genera by the authors; Trigonopoma gracile, T. pauciperforatum and Rasbosoma spilocerca. Of these it was found to form a monophyletic group with Rasboroides meaning these two derived from the same common ancestor. The results for B. brigittae and T. heteromorpha were found to be inconclusive in some respects and further work regarding their phylogenetic position was recommended. Shortly afterwards a paper investigating systematics of the subfamily Danioninae was published by Tang et al. (2010) Their results differed from those of Liao et al. 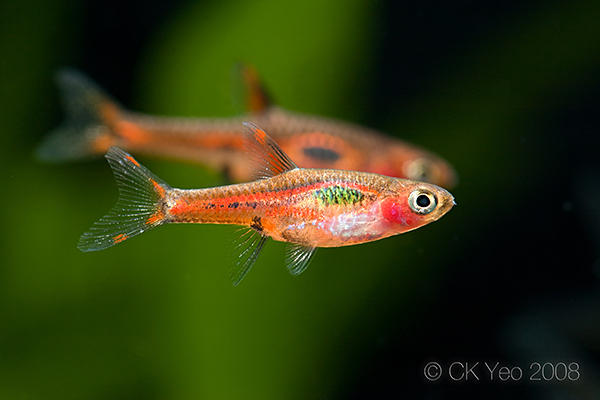 and their conclusion was to synonymise the four new genera plus Boraras and Trigonostigma with Rasbora based on an incomplete knowledge of relationships within the group, an approach they describe as ‘more conservative’. This has not been followed by the majority of authors, however, and the separate groupings are maintained in the extensive work by Kottelat (2013), which is followed here. The small adult size in Boraras species evolved via a process known as miniaturisation, characterised by sexually mature adults with a significantly reduced size of less than 20 mm SL. Among bony fishes cyprinids are one of the few groups in which this phenomenon occurs repeatedly with all Barboides, Danionella, Microdevario, Microrasbora, Horadandia, Boraras, Paedocypris, Sawbwa and Sundadanio species representing miniaturised taxa along with a few members of Danio, Laubuca and Rasbora. All show a preference for still or slow-moving waters, often in nutrient-poor habitats such as forest peat swamps. The anatomical structure of miniaturised cyprinids can vary greatly, and there are two principle ‘groupings’ with some species possessing intermediate features to some degree. The first contains those fishes which though small are essentially proportionally dwarfed versions of their larger relatives, e.g., Barboides, Microdevario, Microrasbora, etc. The other includes those in which anatomical development stops at a point where adult still resemble a larval form of their larger ancestor, i.e., Danionella and Paedocypris. The latter are usually referred to as ‘developmentally truncated’ or ‘paedomorphic’ and are thought to have evolved via a process known as ‘progenetic paedomorphosis’ i.e. paedomorphosis brought about by accelerated maturation. They typically exhibit a simplified skeletal structure along with species-specific morphological peculiarities. Britz et al. (2009) consider that developmental truncation may have facilitated the development of such novelties ‘by freeing large parts of the skeleton from developmental constraints, dissociating developmentally linked pathways and creating a greater potential for more dramatic changes’. Boraras species from the Malay Archipelago (B. brigittae, B. maculatus and B. merah) tend to have a slimmer, more elongate body profile than those from Indochina (B. micros, B. urophthalmoides, B. naevus) which may assist when attempting to identify them. 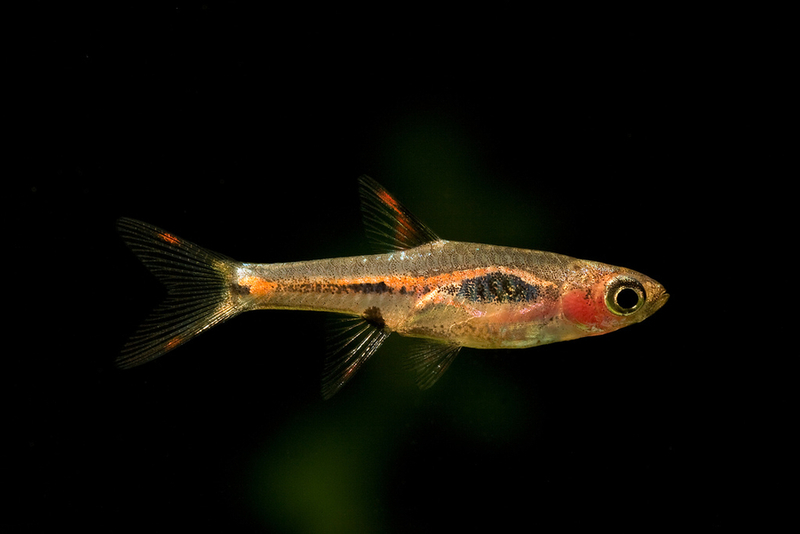 Notes on the taxonomy of some Sundaic and Indochinese species of Rasbora, with description of four new species (Pisces: Cyprinidae). Monophyly of the genus Boraras (Teleostei: Cyprinidae). 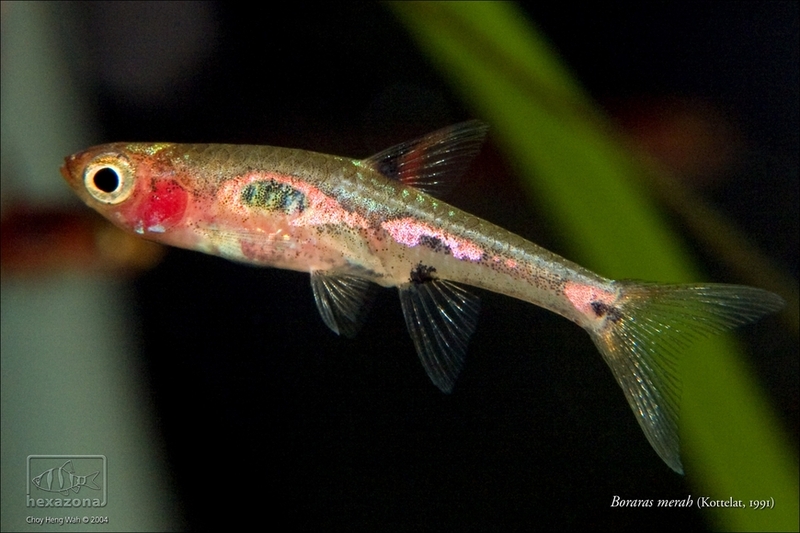 Boraras naevus, a new species of miniature and sexually dichromatic freshwater fish from peninsular Thailand (Ostariophysi: Cyprinidae). Boraras merah ist doch ein Synonym von Boraras brigittae! Have gotten a few young specimens of this species mixed in amongst purchases of Boraras Brigittae. They seem to have no problem interacting and schooling together as one species and this suggests that they may regularly crossbreed. Images No. 2 and No. 6 appear to be specimens of Boraras Brigittae, not Boraras Merah. The patterning which separates the two species is subtle, but distinctive. In my experience, Boraras Merah will always appear with a clearly oval eyespot on its body, with colour trailing laterally down its body and very light flecks of black near the tail. As pictured in 1,3,4,5. Whereas, males and females of Boraras Brigittae may have a broken or complete lateral stripe and varying degrees of red colouration across their body. But not a clearly oval shaped spot.